Committed to the cause of the environment and the socio-economic upliftment of communities through eco-tourism and agriculture, The Department of Environment and Natural Resources (DENR), Department of Agriculture (DA), Department of Tourism (DOT), Ateneo De Manila University (ADMU), ABS-CBN Broadcasting Corporation and ABS-CBN Foundation’s (AFI) Bantay Kalikasan launched the GREEN INITIATIVE. The GREEN INITIATIVE is a collaboration between the National Government, media and the academe with the goal of protecting Philippine biodiversity and eradicating poverty. Under the partnership, AFI, DENR, DA, DOT and ADMU will carry individual key strategic capabilities, that, when joined together in a chosen area, will result in a significant improvement in the quality of life in the community. The selected areas this year and next are Romblon and Bicol which have very beautiful but poor communities. DENR, through Secretary Ramon Paje, commits to the necessary infrastructure needed to protect the project sites. . “The GREEN INITIATIVE is more than just an initiative. Eco-tourism is the only activity that can generate income for the country without exploiting the natural resources,” says Secretary Paje. He also announced during the launch that DENR will release Php 10M for Mt. Mantalingahan in Southern Palawan and another Php 10M for Mt. Guiting-guiting in Sibuyan Island, Romblon. The funds will be used for maintaining the forest guards that will protect the forest. Educational Forest trails will be put up which will provide the sustainability of the project. DOT, through Secretary Ramon Jimenez, commits to facilitate the investment of tourism infrastructure and complementary facilities through the Department of Public Works and Highways. “Our role is to create positive awareness for these eco-tourism sites. We make positive awareness to local and international tourists and most importantly, we create awareness within the government itself. Sec. Paje and I are putting just enough pressure so that infrastructure is built to make travel to these very precious areas seamless,” shares DOT Secretary Jimenez. “Poverty alleviation is giving people livelihood and tourism is the fastest way to do that”. DA, through Secretary Proceso Alcala, commits to provide the agricultural infrastructure needed to uplift the projects’ agricultural production; while ADMU, through Fr. Jett Villarin will handle the academic community which will get baseline data and monitor and evaluate the projects. Another supporter of GREEN INITIATIVE present at the event was the Philippine Medical Association (PMA). Through its president, Dr. Leo Olarte, PMA committed to conduct medical and dental missions for the indigenous people at the chosen ecotourism sites. They will provide health assessment and give seminars to the community. 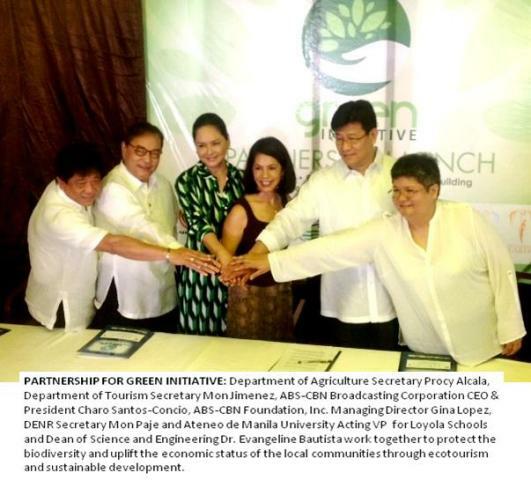 Miss Earth Foundation will support the public relations and marketing aspects of the GREEN INITIATIVE while ABS-CBN Broadcasting Corporation will manage and facilitate the media exposure of the projects.